Mastoiditis is an inflammation or infection of the mastoid bone, which is a portion of the temporal bone. The mastoid consists of air cells that drain into the middle ear. Mastoiditis can be a mild infection or can develop into life-threatening complications. Mastoiditis is usually a complication of acute otitis media (middle ear infection). Mastoiditis usually results when inflammation of a middle ear infection extends into the mastoid air cells. A child with mastoiditis usually has had a recent or recurring middle ear infection(s). Antibiotics for ear infections reduce the risk of mastoiditis. How do you diagnose mastoiditis? We start with a complete medical history and physical examination. We then inspect the outer ear(s) and eardrum(s) using an otoscope, a lighted instrument that allows us to see inside the ear. A pneumatic otoscope blows a puff of air into the ear to test eardrum movement. Another test we might use is tympanometry, which can determine how the middle ear is functioning. Tympanometry does not tell whether the child is hearing or not but helps to detect changes in pressure in the middle ear. If tympanometry is performed, the child must remain still and not cry, talk, or move. (This can be difficult!) 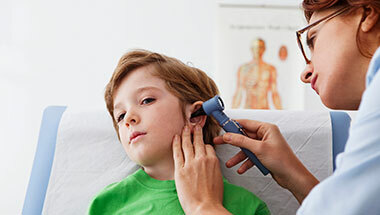 If a child has frequent ear infections, we may suggest that a hearing test be performed. Computed tomography scan (also called a CT or CAT scan), a diagnostic imaging procedure that uses a combination of X-rays and computer technology to produce cross-sectional images, or horizontal and vertical “slices,” of the body. A CT scan shows detailed images of any part of the body, including the bones, muscles, fat, and organs. Magnetic resonance imaging (MRI), a diagnostic procedure that uses a combination of large magnets, radiofrequencies, and a computer to produce detailed images of organs and structures within the body. If your child has symptoms of meningitis, your child’s physician may order a lumbar puncture. During this procedure a special needle is placed into the lower back and into the spinal canal, the area around the spinal cord. The pressure in the spinal canal and brain can then be measured. During a lumbar puncture, a small amount of cerebral spinal fluid (the fluid that bathes the brain and spinal cord) is removed and sent for testing to determine if there is an infection or other problems. What are the symptoms of mastoiditis? Because symptoms of mastoiditis may resemble other medical conditions or problems, consult your child’s physician for a diagnosis. Treatment usually requires hospitalization and a complete evaluation by an otolaryngologist (a physician who specializes in ear, nose, and throat disorders). In most cases, treatment will consist of antibiotics given through an intravenous (IV) catheter (a thin tube). Surgery may be needed to drain the fluid from the middle ear and/or mastoid bone. Your child’s physician may suggest a myringotomy, a surgical procedure that involves making a small opening in the eardrum to drain the fluid and relieve the pressure from the middle ear. A small tube may be placed in the opening of the eardrum to ventilate the middle ear and to prevent fluid from accumulating. Hearing is restored after the fluid is drained. The tubes usually fall out on their own after six to 12 months. What are the effects of mastoiditis? Early and proper treatment of mastoiditis is necessary to prevent the development of these life-threatening complications. Please consult with your physician before making any decisions about your healthcare.